Could you please share this beautiful song, “Triumph of the Cross” by Nelly Shin (Korean-Canadian and her artist name is Eden’s Rose) with the Korean War Veterans and their family members. She composed this song with her heart. While she is composing the song, Nelly fasted for 2 days and immersed herself in the song. Here is her bio. Eden's Rose's songs have three times been recommended to radio by consultant, Eric Norberg through his publication, Adult Contemporary Music Research Letter (Portland, OR). In 2014, Rhythm of Your Dreams reached No. 4 on Eric Norberg's Top 15 singles list after Celine Dion, Indina Menzel and Sara Evans. It also appeared at No. 2 on Top40-Charts.com's Top 20 World Adult Singles chart, preceding Let it Go. On the live stage, Eden's Rose has performed for dignitaries at ceremonial events. In 2012, she composed an original song for the Town of Richmond Hill, ON and performed it live for the Mayor. She has recently performed her newly penned song, Triumph of the Cross (2015) for Canadian war veterans in honour of their sacrificial service during the Korean War. Eden's Rose's singing goes back to multiple roots which give her voice a unique sound. She grew up listening to country and popular music. 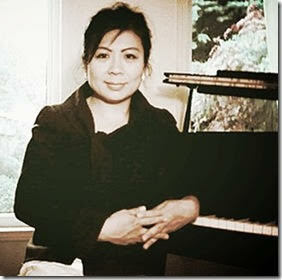 During her undergraduate years, she received classical vocal training. After rededicating her life as a Christian in 1996, she gravitated toward Gospel music. Some of her early public appearances as a singer have been as a soloist at the televised Peoples Church in Toronto. She also made appearances on CFMT (now OMNI), where one of her Christmas videos, O Holy Night received multiple telecasts due to popular request (1998). Today, Eden's Rose continues to sing both inspirational and popular music. The piano was where it all began for Eden's Rose. She started taking lessons at age eight and composed her first original work, Yearning, at age fifteen. The Chopinesque piano ballad eventually became the opening track on the album In Search of Eden (2013). She won several awards during her teens at the Kiwanis Music Festival of Greater Toronto, including two First Awards for her original compositions. After assuming Eden's Rose as an artist name in 2009, she has produced her own songs. Her discography includes three piano instrumental albums (Paradise Memoirs, In Search of Eden, Postcards from Banff) and one song EP (Heaven's Best). She is currently completing an inspirational romance novel and is working toward recording her first full length song album as Eden's Rose. Eden's Rose is a Canadian singer-songwriter, composer, and pianist, whose music has been heard on radio, television and live concerts in Canada and the US. She has performed at high profile venues like Toronto Centre for the Arts, the Listening Room (Nashville) and Hard Rock Café (Toronto). A graduate of the University of Toronto Faculty of Music, Eden's Rose holds a Bachelor of Music for studies in piano and composition. Her journey as a recording artist launched publicly in 2005 with the release of her first single, Marrow of My Heart, which received airplay in Canada and the United States. Her music has also aired on Brisbane, Australia's 4BH (Magic 882). It is the first track on her debut album, which was released in 2005 under her original name, Nelly Shin. The CD was produced by Brian Gagnon, who has toured with Rush and recorded Shania Twain in her early years. Eden's Rose's single, Till You Came for Me My King (2010) continues to air during the Christmas season on Christian radio.